The next (and first!) welcome call will be on Monday, March 18th at 12:30pm EST. If you would like to participate or have any questions, contact us directly at 1-888-203-9990 ext 0 or email campaign@stephenlewisfoundation.org. 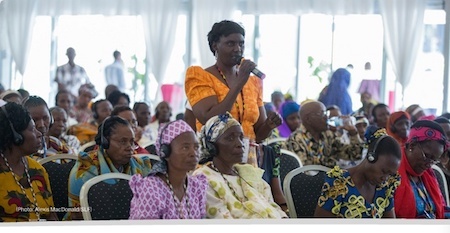 Determined and excited, 200 Tanzanian grandmothers from across the country gathered in Arusha to hammer out an agenda for change. They came together to share their experiences and expertise – and to address the challenges, heartaches and successes they have had in raising their grandchildren orphaned by AIDS. . . . .
Grandmothers from around the world – including from Canada, Australia, the United Kingdom, and the United States – have joined us in solidarity. Learn more and read their powerful cloing statement, beginning with "Grandmothers are the pillars of our nation." 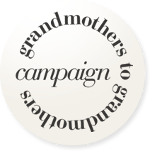 Grandmothers to Grandmothers Campaign Celebrates 10 Years! See more inspring video clips. Click here. Learn about the goals and history of the Grandmothers Campaign. It's an inspriring, intriguing story. Click here. "The Grand­moth­ers to Grand­moth­ers grass­roots move­ment isn’t your granny’s craft fair." "Africa has become a continent of orphans . . . as many as 13 million children have been orphaned by AIDS in sub-Saharan Africa. Normally, family members care for children when their parents cannot but with so many orphans traditional support systems are being stretched. In the midst of this devastation, grandmothers have emerged as the 'unsung heroes' of Africa. The Stephen Lewis Foundation launched the Grandmothers to Grandmothers Campaign in March 2006, in response to the emerging crisis faced by African grandmothers as they struggled to care for millions of children orphaned by AIDS. The Campaign aims to raise awareness, build solidarity and mobilize support in Canada for Africa’s grandmothers. African and Canadian grandmothers met in Toronto and we say, "We will not rest until you do." “It’s quite extraordinary to see the bond that has developed between grandmothers on both sides of the ocean. Love of grandchildren is deep, enduring, joyful and universal.